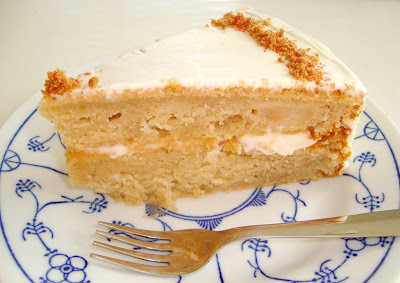 For me, Fall has officially begon with this Apple-Spice Layer Cake. I found some gorgeous red apples in my backyard yesterday and today I decided to make use of them. I was thinking of maybe baking an apple crumb pie, but I just have been craving a cake lately so I settled on an Apple Cake from Martha Stewart's Baking Handbook. I'm so excited to tell you that this cake is - hands down - one of the best cakes I have ever baked! 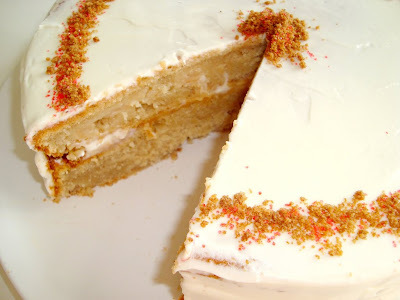 Sooo incredibly yummy, and I know I say that a lot but, this one is sooo good, there is only 1 slice left as I am typing this (just a mere 4 hours after baking). Rating: can I give a 6 out of 5?! - Into a medium bowl, sift together flour, baking powder, baking soda, salt, cinnamon, allspice, ginger and nutmeg; set aside. In a small bowl, combine milk and vanilla; set aside. - In the bowl of an electric mixer, beat the butter, sugar and honey on medium-high speed until light and fluffy, 3 to 4 minutes, scraping down the sides of the bowl as needed. Add eggs, one at a time, beating for 1 minute after each addition, until smooth. - With mixer on low speed, add flour in three parts, alternating with the milk mixture and beginning and ending with flour; beat just combined after each, being careful not to overmix. Add applesauce; mix to combine, about 1 minute. 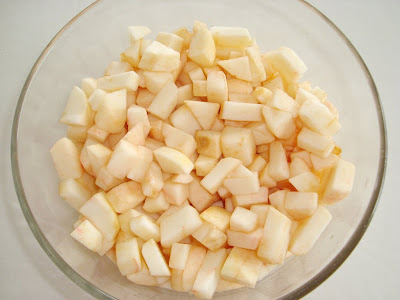 Fold in apple chunks. 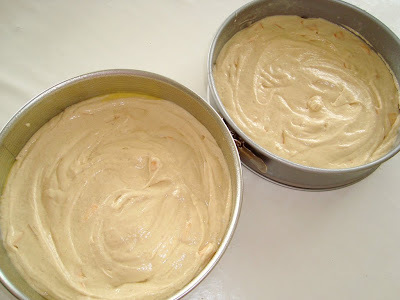 - Divide batter among two 9-inch pans. Bake, rotating pans halfway through, until cakes pull away from the sides of the pans and a cake tester comes out clean, 40 to 45 minutes. Transfer pans to a wire rack to cool 20 minutes. Reinvert cakes and let them cool completely, top sides up. Chopped apple-pieces from my own home-grown apples. The batter was so incredibly lickable, I knew then that this cake was going to be amazing. You're supposed to eat the cake upside-down, so that's what I did. I crushed some speculaas cookies (Dutch equivalent to gingerbread cookies) and used the crumbs for garnish. That looks delicious..... I agree that there is nothing that says "fall" like apple in anything baked! How lucky are you to find apples in your back yard!? 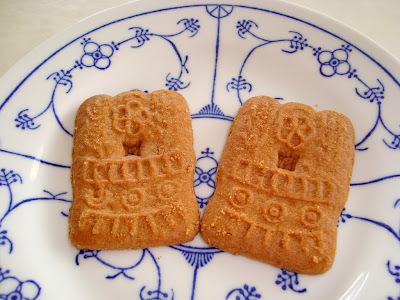 The crushed speculaas cookies are fun and were nicely done (do you have a secret for making such a nice well-done circle!?). That's a high rating, I'm sold! Those apple chunks look amazing. And your decoration on top of the cake is very pretty. Great idea to use the cookie crumbs to decorate! Seeing everyone's apple recipes is getting me excited for fall. Wowser - that cake looks amazing! I am very impressed with this cake! 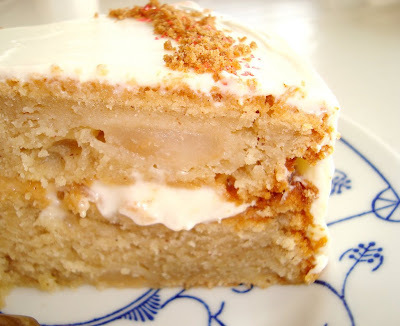 Firstly cause I am rather partial to apple in my cakes, and secondly because speculaas cookies frequent our home around Christmas time when our Dutch "Family" friends send us some, oooh they are my favourite, such an amazing flavour! Can't go wrong with an apple dessert, especially in the fall. 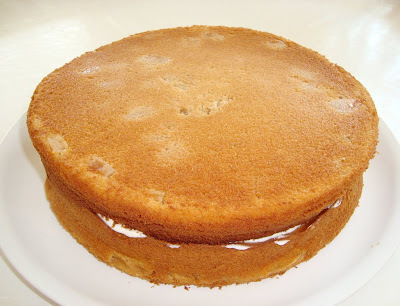 My apple cakes tend to come out more like bread but this is such a beautiful looking cake :). wow, that looks amazing, and the garnish idea is fabulous. Amazing! I just made this cake today, and I have to say it is delectable. It is so smooth, moist and just delicious! 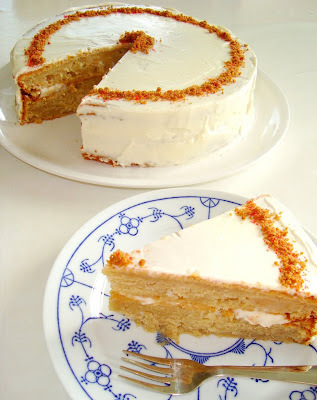 Also, for anyone wanting to make this cake, I took a few bites before I put the frosting on, and this could also be made into a bread using the same recipe (just maybe without the chunks). I will definitely be making a bread using this recipe as well.